Last month I was in Ukraine with work. We didn’t make it to any Ukrainian restaurant, but we did go to a fantastic Georgian place that served the most amazing cheese-stuffed bread. 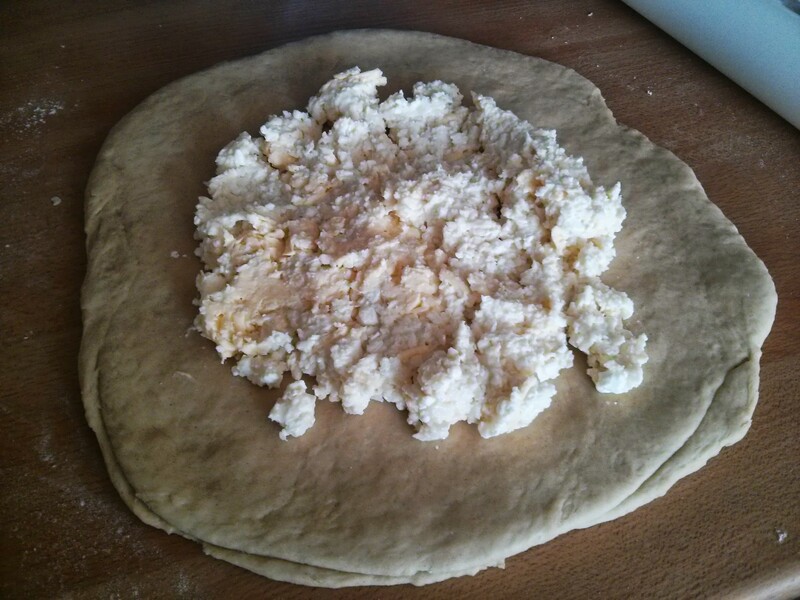 I asked out hosts about it and found out it was a Georgian speciality called Khachapuri bread. When I got back home I looked it up on the intertubes and found the recipe on a Georgian website, so of course I had to make it myself. 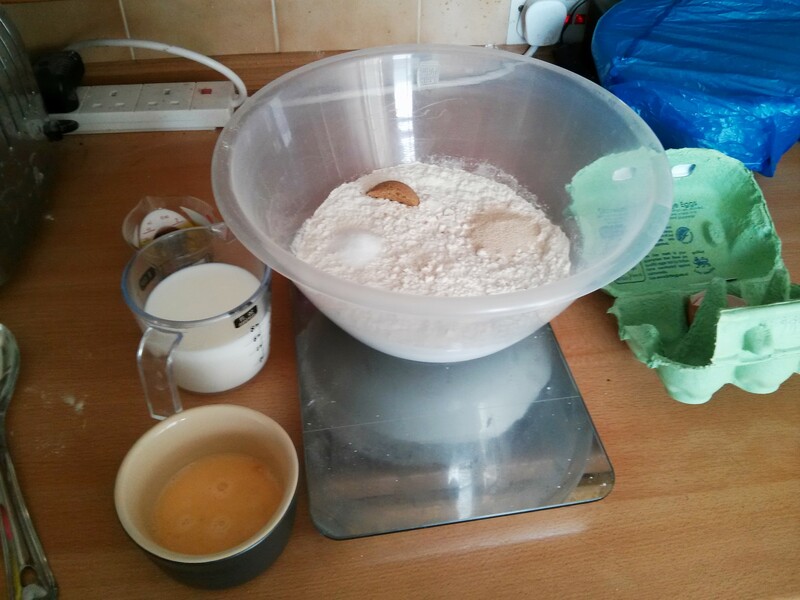 Making the dough is pretty straightforward, basically bung it all in a bowl and mix by hand! 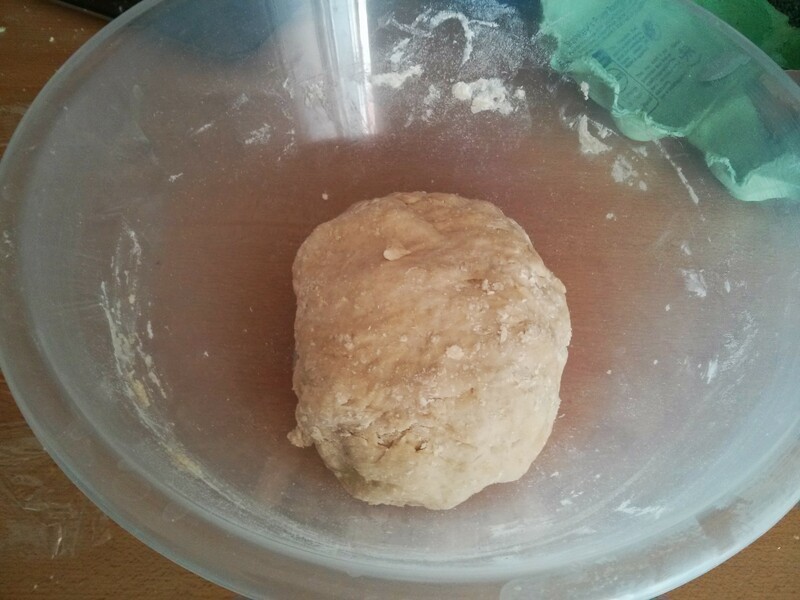 Once formed into a ball it’s very dry, but I was good and didn’t start fiddling with the recipe! 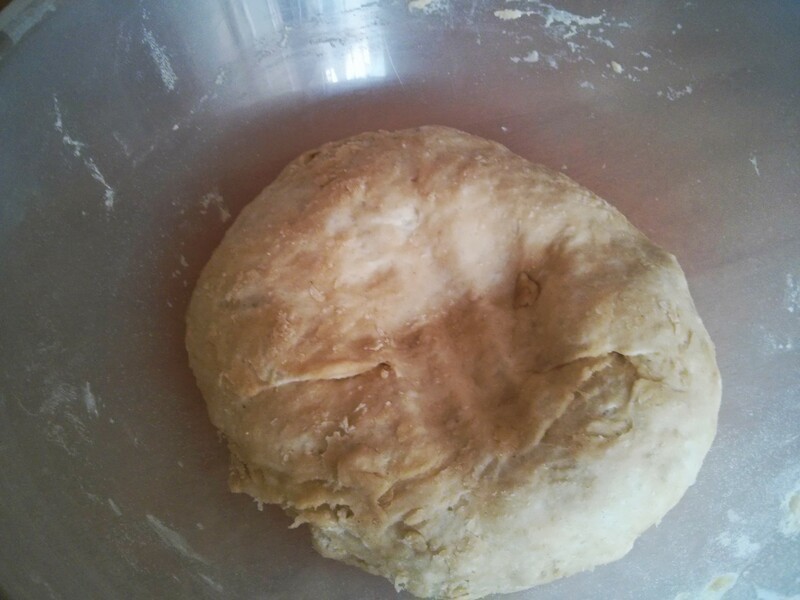 That raises for two hours… and while it hadn’t risen like the recipe shows, but it had risen. 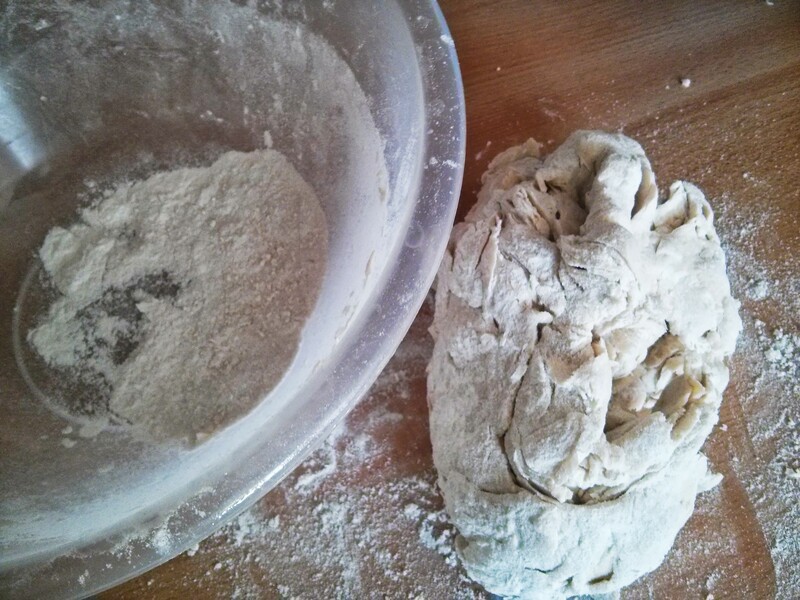 Despite how dry it is, even more flour is added at this point! 75 grams, but I couldn’t get that much in… I guess I got about 50g extra in. 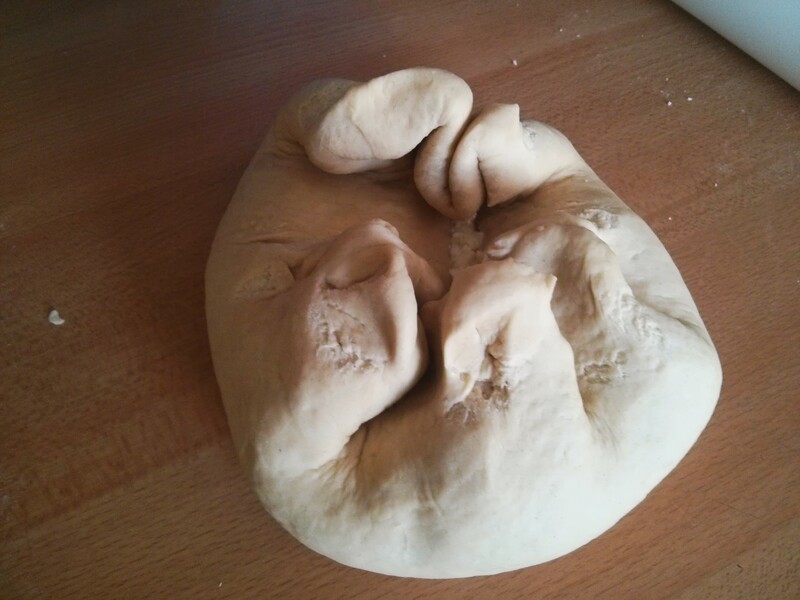 After kneading for about five minutes it looks a lot more like bread dough! 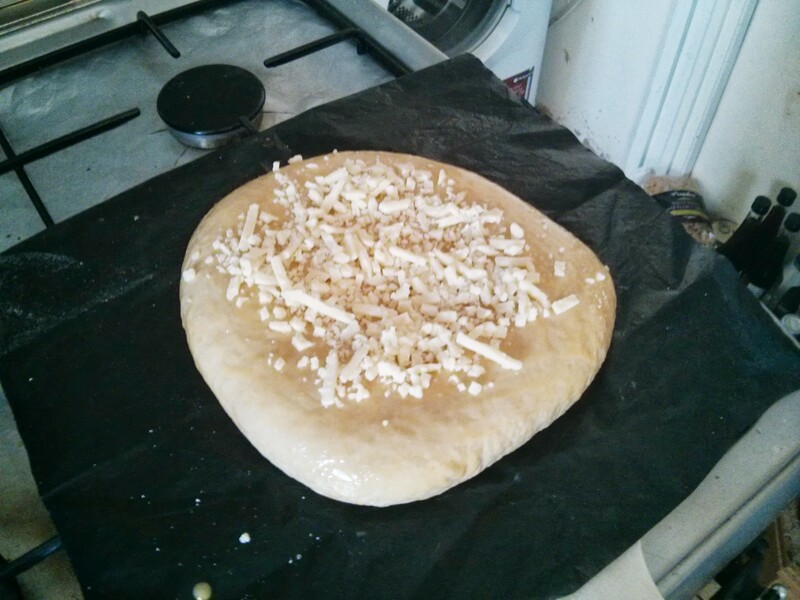 This gets rolled out ready for the filling. 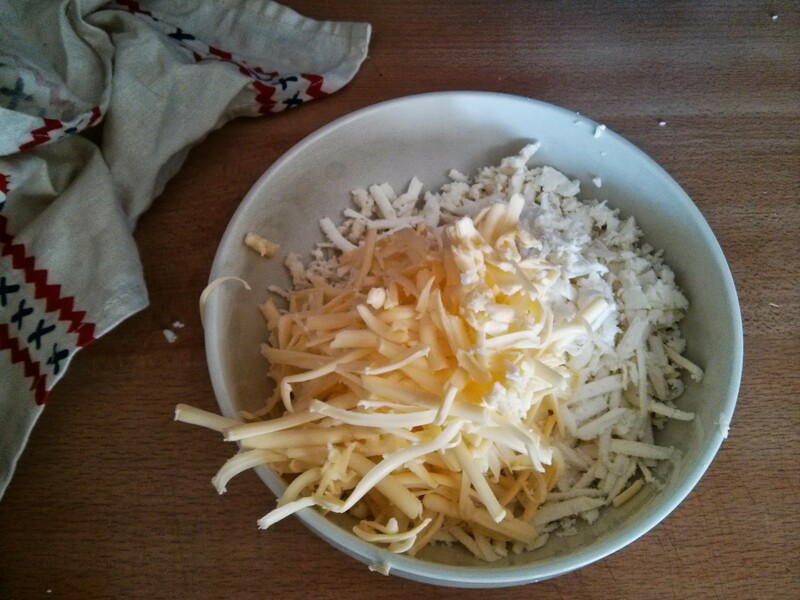 The cheese and butter all gets grated. This gets mixed up with the whisked egg. 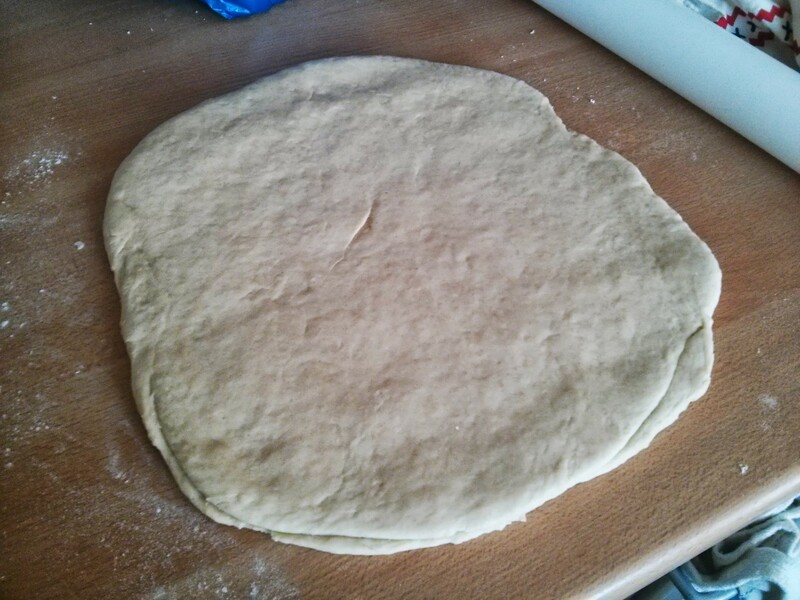 This gets added in the middle of the rolled out dough. You then pull up the sides to form a pouch. You then turn it over and flatten as much as you can. 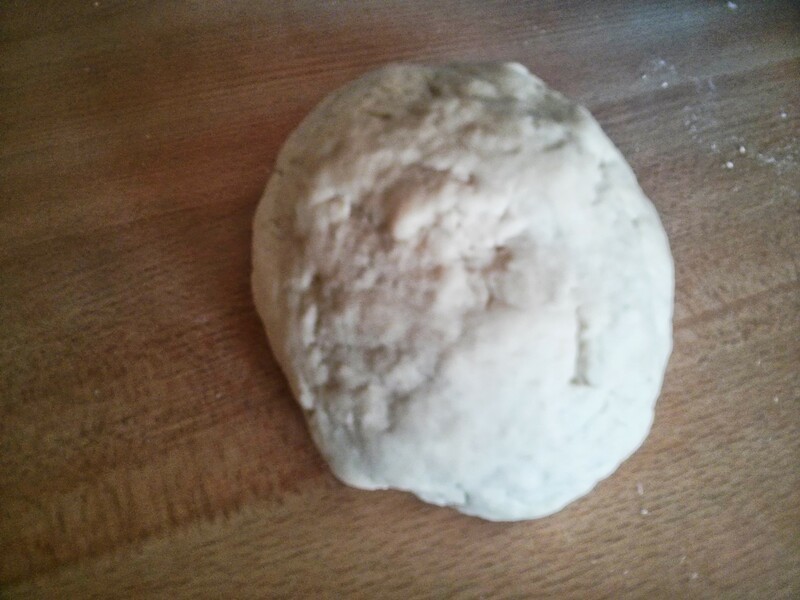 I didn’t get it that flat… it kept springing up, and I was worried if I pushed too hard I’d split the dough. 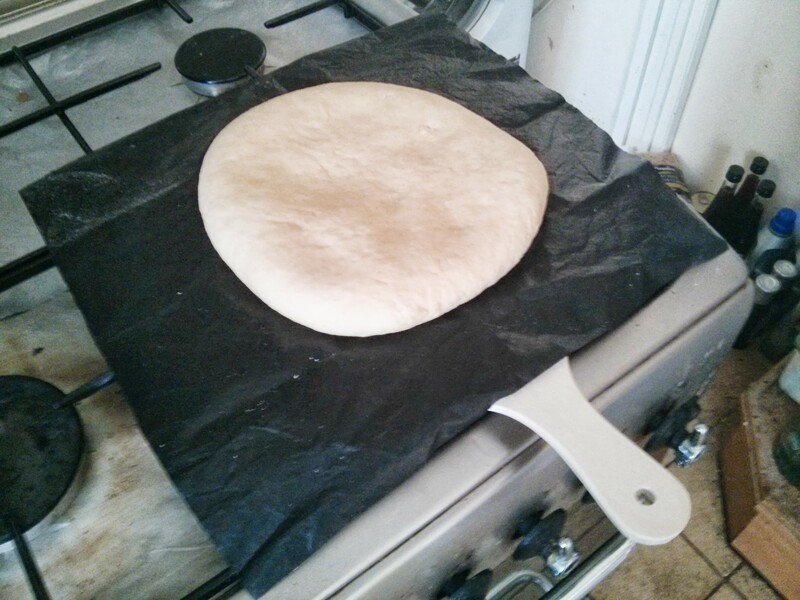 I put it on a silicone sheet in a pizza peel to make it easier to get into the oven. Finally you do an egg yolk wash, and I sprinkled some reduced fat cheddar on top, as I remember the bread I had having cheese on top. 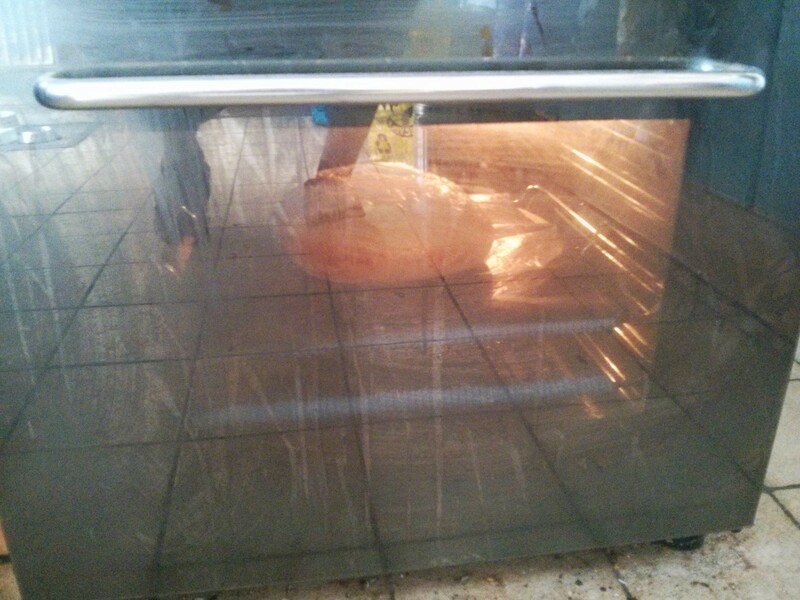 The recipe calls for baking for 15 minutes in a ‘medium’ oven… I went for 170c fan. 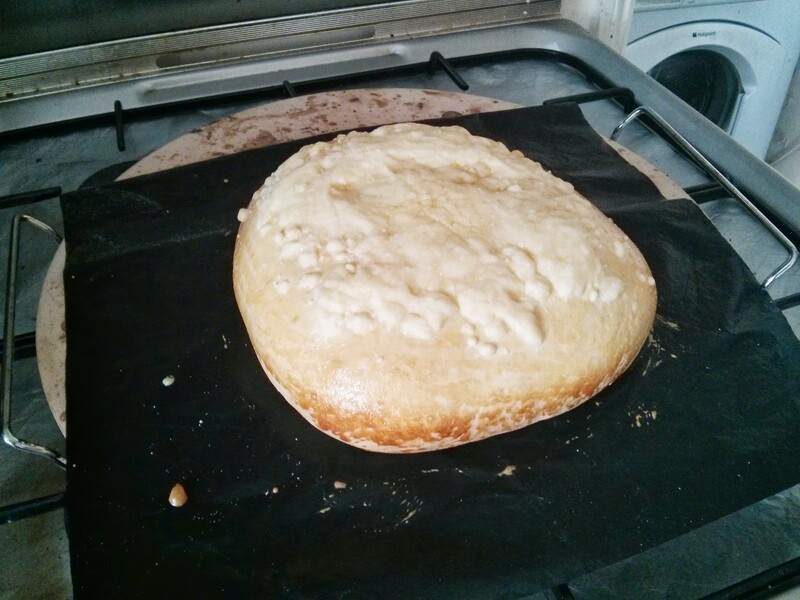 I also used a pizza stone, and to make sure it was properly hot I let it heat up for a good hour before cooking. AFter 15 minutes… it had poofed right up, but it looked nicely browned. Thanks to the silicone sheet it was easy to transfer to the cutting board. Cutting into it… and the filling falls out a bit! 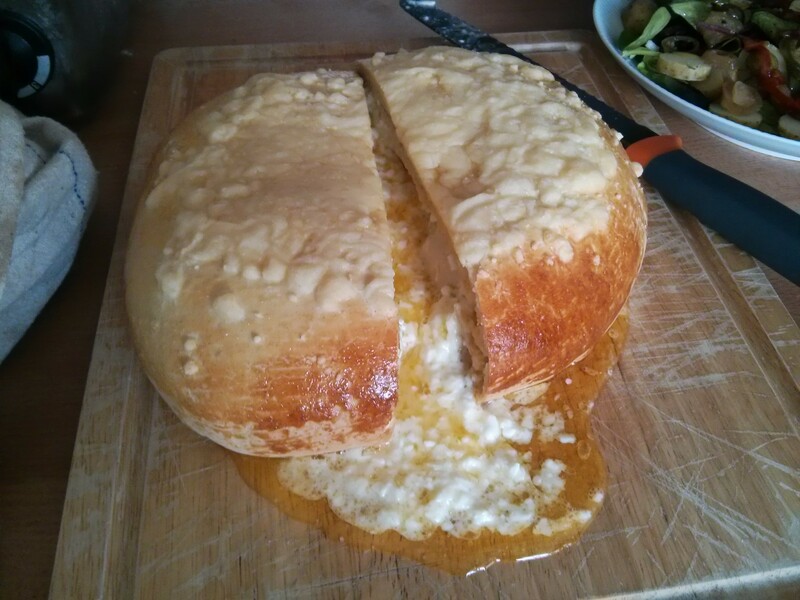 But more importantly, it’s all melty and cooked. 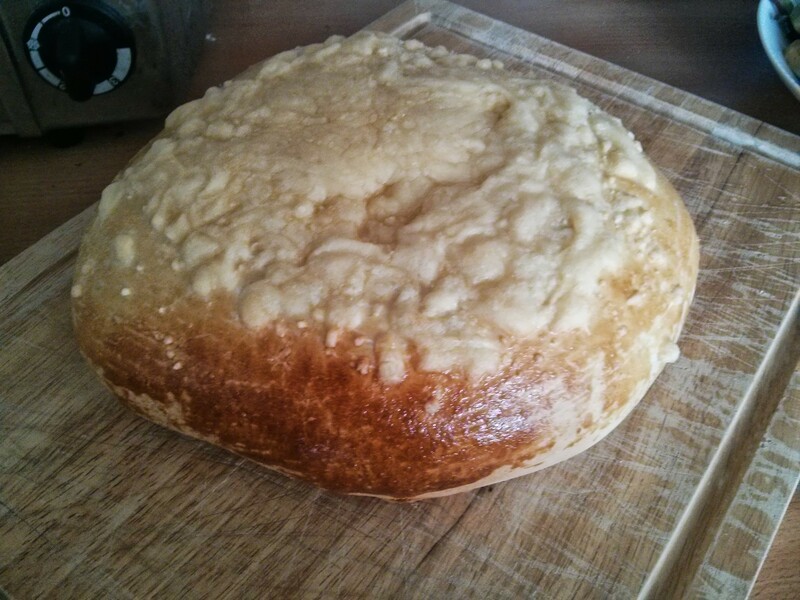 One of the hardest things about making bread is letting it cool before eating it. Thankfully this bread is made to be eaten hot! 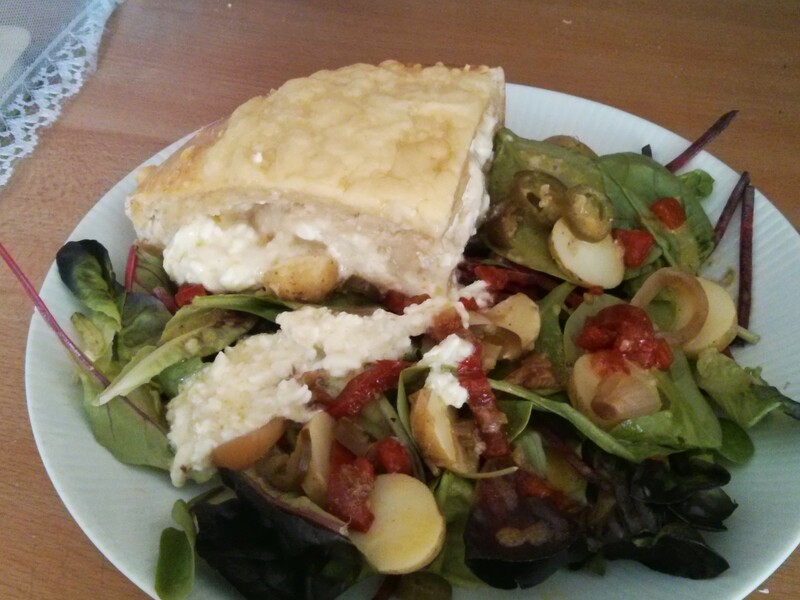 So we served up on salad and ate it… and it was amazing! Not as flat as the bread I had in Ukraine, but just a nice! Sounds, and looks, delicious. 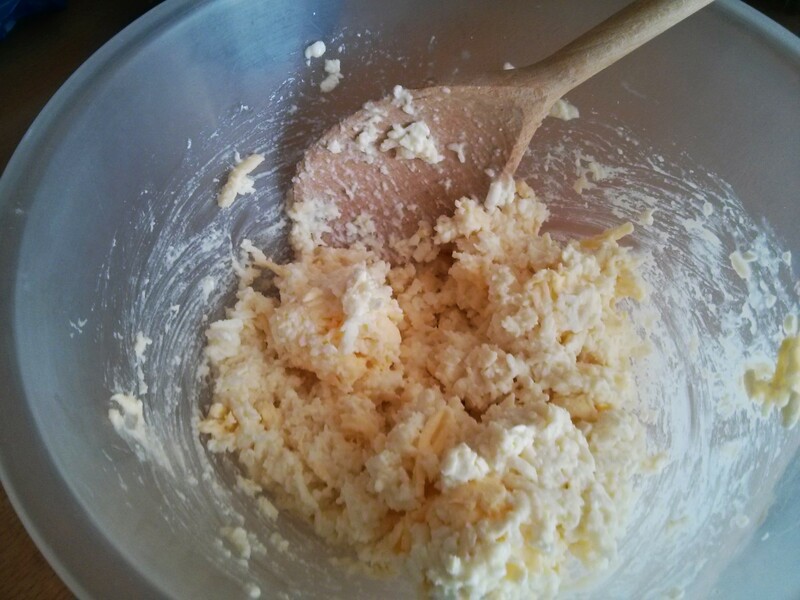 I don’t know how you managed to grate mozzarella and feta as they are both soft, squishy cheeses. Straight from fridge helps. As does removing the bad bits for the picture!